Inciting A Riot: Milestone: I'm Searchable on iTunes! Milestone: I'm Searchable on iTunes! Don't want to have to click a stupid hyperlink just to find your favorite podcast in all the world on iTunes? Well, I'm now searchable! 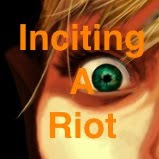 So, when you're looking for Inciting A Riot: the Podcast, just type in Inciting A Riot into your iTunes search browser. I pop right up! Total coolness!! !